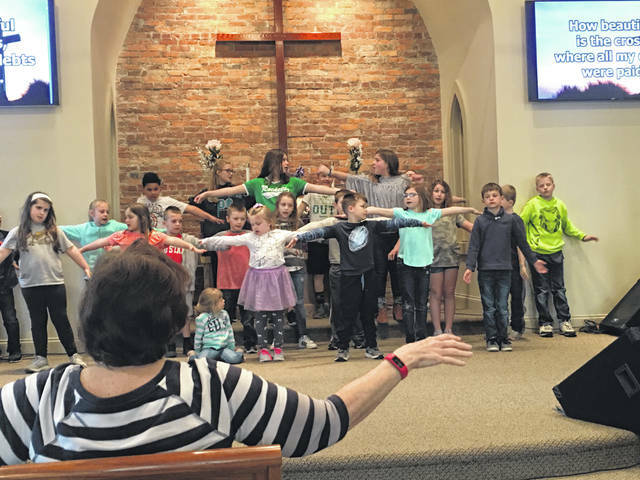 Children’s Ministry Coordinator Janice Locker leads the children choir members from Botkins and Anna United Methodist Churches in a rehearsal for “O Happy Day.” The musical will be performed Sunday, April 14, at 2 p.m. at the Anna church. ANNA — The United Methodist Churches of Botkins and Anna have two big events coming up next week – Holy Week for Christian churches. The sanctuary of the Anna Church will host a special program on Palm Sunday afternoon, April 14, at 2 p.m. The children of both churches have been working hard under the leadership of Children’s Ministry Coordinator Janice Locker, on a musical titled “O Happy Day.” The play contains several songs by the joint children’s choir as well as several solos. Some of the children will help lead into the Chancel Choir’s presentation of the cantata “The Cup, the Cross, the Crown.” This Easter musical will help those in attendance really focus on the meaning of Holy Week and the Easter celebration of the following Sunday. Thursday, April 18, – Maundy Thursday – has always been a very meaningful service for the Christian Churches. The service will be held at the Botkins sanctuary at 7 p.m. Pastor Randy Locker will be sharing the message of the night in song, telling the story from the vantage point of several who were there. The message “They Were There” will tell the story of the crucifixion from Mary, the mother of Jesus; Simon of Cyrene, who was forced to carry the cross of Christ; one of the thieves who hung beside Jesus; a Roman soldier who drove the nails into Christ’s hands and feet; Jesus, himself; and all people looking back on the scene trying to figure out who Jesus is to them.